Jacky specializes in adults with a history of attachment issues and complex trauma. 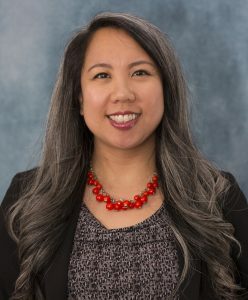 Jacky’s previous role was supervisor for Healthy Families Fairfax, a home visiting program that works with mothers on strengthening their bond with and increasing empathy for their infants through developmental education, activities, and self-reflection. Jacky’s experience in this position expanded her understanding of the critical role that secure attachment in early caregiving plays on a person’s lifelong emotional development. Jacky appreciates the complex consequences that arise when clients feel insecure in their relationships due to possible attachment wounds, abuse, and neglect, therefore she intentionally approaches sessions from a compassionate and strengths-based perspective. In addition to working at The Viva Center, Jacky is a therapist at The Women’s Center. She works with individual clients and leads a weekly support group for survivors of emotional abuse. Jacky has been practicing Buddhist vipassana (insight) meditation for 10 years. Jacky completed her Master of Social Work in 2017 at The Catholic University of America’s School of Social Service. Her undergraduate degree is in Art History.